It has been a full week. Heck, it has been a full month + year. Yesterday when I came home from work and walked into the house it smelled wonderful. 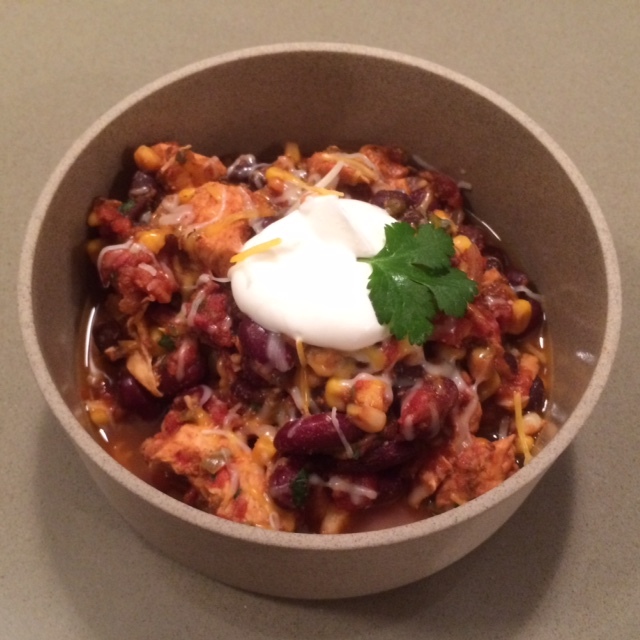 Chris had made a new recipe: Chicken Taco Chili. It was a struggle to actually get dressed and go for my run. I even dabbled a bit and had a few bites with some lime chips before my run — I just could not resist. In terms of the additional toppings the recipe lists below. We added the cilantro, shredded cheese, and sour cream on top. It was delicious. Although as I ate a bowl after my run (scooping up bites with my favorite — lime chips) I thought this is basically nachos. I laughed because I recently read Jim Gaffigan’s book “Food: A Love Story” and he mentions how mexican food is all the same ingredients served in different ways. Quesadillas are tacos, grilled in a pan, which are the same as enchiladas and nachos. You get the point. In any case — enjoy! Additional cilantro, shredded cheese, chopped scallions, red onion, sour cream, etc. Combine ingredients 1 through 14 in a slow cooker*. Stir until combined. Place uncooked chicken on top and cover. Cook on low for 6 hours or on high for 4 hours, stirring occasionally. Thirty minutes before serving, pull chicken breasts apart with two forks. Stir and continue cooking. Top with fresh cilantro or any other desired toppings. * Tip: If you don’t have a slow cooker, you can also use an oven safe, 5 1/2 quart or larger pot. Simmer at 350 degrees, stirring occasionally, for 3 hours.